Does It Make Financial Sense To Donate a Car to a Kidney Kars? It’s easy to donate a car to charity if all you want to do is get rid of it. Simply call a charity that accepts old vehicles, and it will tow your heap away. Allowing taxpayers to deduct the full fair market value for all those donated vehicles cost the IRS a lot of dollars, however, so the agency tightened the rules. Today, you can only deduct a vehicle’s fair market value under very specific conditions. We’re going to walk you through those conditions, with the usual proviso that you should discuss these issues with your tax preparer before you act. Also note that if your state or locality also levies income taxes, other rules may also apply. If you want to claim fair market value for your car donation to reduce your federal income taxes, you must itemize deductions, says Twila D. Midwood, an enrolled agent based in Rockledge, Florida. An enrolled agent is a tax expert who can represent clients before the IRS. If you’ve always filed 1040EZ tax returns and you plan to keep filing them, you won’t be able to deduct any amount for the car donation. You can file a regular 1040 tax form and itemize, even if the donated auto is your only deduction. That’s usually not the best choice, however, unless you like paying a lot more taxes to the IRS than you must. Here’s the math: Suppose you are in the 28 percent tax bracket. Your donated car’s value, and thus the deduction, is $1,000. “The $1,000 deduction will save you $280,” Midwood says. If you’re in the 15 percent tax bracket and you donate a car worth $1,000, it will only reduce your taxes by $150. If instead you take the standard deduction, which in 2012 was $5,950 for a single individual or $11,900 for a married couple filing together, you save thousands of dollars over filing an itemized return only for the purposes of detailing your car donation. The only way that donating a car nets you any tax benefit is if you have many deductions, and if their total sum, including the car, exceeds your standard deduction. Religious organizations are a special case. They do count as qualified organizations, but they aren’t required to file for 501(c)(3) status. To help you determine whether a charity is qualified, the easiest thing to do is visit the IRS’s exempt organizations site. You also can call an IRS toll-free number: (877) 829-5500. If you do this, you’ll have to listen to some recorded information about tax forms that probably don’t apply to you. You’ll then be given the option to “Press 2” to talk to a customer service rep about exempt organizations. Note that the waits can be quite long: up to 30 minutes. You can always donate as much as you want to charities, but the IRS limits how much you can claim on your tax return. “Charitable donations can’t exceed 50 percent of your gross income,” Midwood says. 2. When the charity intends to make a “significant intervening use of the vehicle.” This means the charity will use the car in its work, such as delivering meals to needy people. 3. When the charity intends to make a “material improvement” to the vehicle, which is “anything that increases the car’s value and prolongs its life,” Midwood says. “It can’t be a minor repair or maintenance; it must be something like fixing the engine or systems that run the car,” she says. 4. When the charity gives or sells the vehicle to a needy individual at a price significantly below fair market value, and the gift or sale is part of the charity’s mission of helping the needy who need transportation. To recap, the IRS defines fair market value as the price a willing buyer would pay and a willing seller would accept for the vehicle, when neither party is compelled to buy or sell and both parties have reasonable knowledge of the relevant facts. Neither the buyer nor the seller can be an auto dealer. Both must be private parties. Here’s an example: Let’s say your car is a 2003 Honda Accord DX sedan (the lowest trim level). It has 200,000 miles and it’s in “average” condition. Edmunds estimates it would be worth $1,862 in a private-party sale in Southern California. You can’t instead claim the $5,318 private-party value of a Honda Accord EX sedan (a much higher trim level) with 100,000 miles in “clean condition” (a condition grade that’s one step up from “average”). It’s not realistic to expect that your car will meet one of the most stringent fair market value requirements. Take it from 1-800-Charity Cars, which says it is the largest car donation charity in the United States. It picks up donated vehicles from across the country and gives as many of the cars as possible to people who need transportation. According to the charity, few donated cars are suitable to give to the people it serves. “If 5 percent go to our clients, I’m thrilled,” says CEO Brian Menzies. “Although we take any car, about one-third go straight to salvage, i.e., junk.” The rest are auctioned and the proceeds go to the charity of the donor’s choice, he says. The point that Menzies is making is this: Unless your car is in good or excellent condition, it will most likely be sold at auction or to an auto salvage yard. In that case, your deduction is based on the car’s selling price, not your fair market value estimate. If the April tax deadline is approaching and the charity still hasn’t sent you a notification of your vehicle’s sale, such as an acknowledgement, receipt or form 1098-C, you have two options. According to IRS Publication 526, the first option is to file Form 4868 to request an automatic six-month extension of time to submit your return. Your second option is to file the return on time without claiming the deduction for the qualified vehicle. When the charity finally sends your notification, you can file an amended return using form 1040X to claim the deduction. You’ll have to attach a copy of the notification to your 1040X. Getting tax benefits for a donated car requires a lot of documentation, whether the car is junked, sold at auction or given to a charity’s client. IRS Publication 4303 has all the details. One tip: Keep all the papers or electronic files. You’ll need them at tax time. Besides giving your car directly to a charity, there is another way your vehicle can help a charity and also maximize your tax benefits: You can sell the vehicle yourself and donate the proceeds. 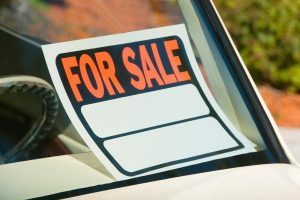 “If the qualified organization is going to sell the vehicle in order to receive cash, then it would make sense for an individual to sell the vehicle to a private party to maximize the amount of cash proceeds,” Midwood says. Selling any car can be a hassle and selling one that’s on its last legs poses challenges of its own. How you proceed depends on your goal. Are you focused on getting rid of a junker with minimum effort and you’d look at the tax deduction as a nice bonus? Then donating your car makes good sense. If your goal is to maximize your tax deduction, carefully review the steps here and then make your decision. Whatever you decide to do, parting with your old car could help a nonprofit carry out its mission. And it also might make room in your garage for a new car. https://www.towkars.org/wp-content/uploads/2018/02/towkars-car-donation-logo-300x165-300x165.png 0 0 kidneyadmin https://www.towkars.org/wp-content/uploads/2018/02/towkars-car-donation-logo-300x165-300x165.png kidneyadmin2016-09-29 15:35:512018-02-16 03:16:46Does It Make Financial Sense To Donate a Car to a Kidney Kars? 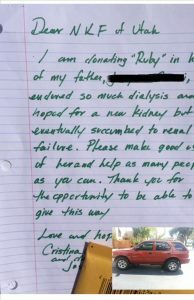 I am donating “Ruby” in honor of my father who endured so much dialysis and hoped for a new kidney but eventually succumbed to renal failure. Please make good use of her and help as many people as you can. Thank you for the opportunity to be able to give this away. Love and Hope, Cristina and Josie. 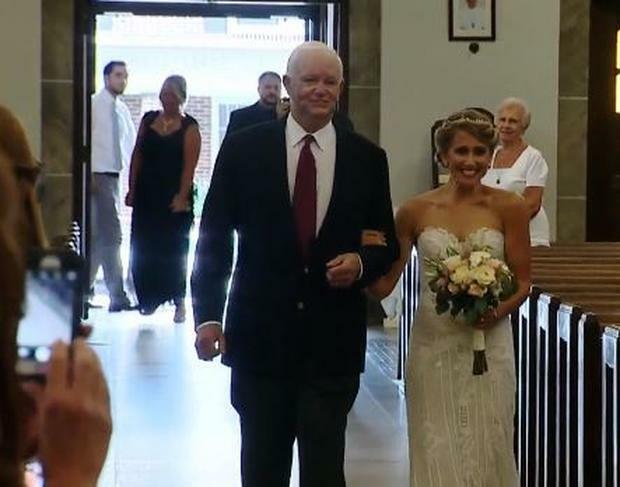 Pennsylvania bride given away by man who received her dad’s heart. Ready for your Monday Cry? This is a dad with heart. PITTSBURGH — “It has been the best day of my life,” a Pennsylvania bride said of her wedding day. Jeni Stepien is now officially a married woman, and she told CBS Pittsburgh the day wouldn’t have been possible without Arthur Thomas. “You can never imagine what that would be like unless you actually do it because so many emotions involved in what you’re doing,” Thomas said. 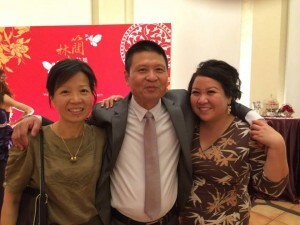 Arthur, fondly known as ‘Tom,’ traveled from New Jersey to walk Jeni down the aisle at St. Anselm church in Swissvale, since her father couldn’t be there. Jeni met Tom for the first time on the eve of her wedding, when she felt her father’s heart beat for the first time in 10 years. Michael Stepien was murdered in Swissvale back in 2006. Tom received Michael’s heart after his death. “I was on death’s door when he was murdered and I needed a heart or I was going to be dying in the next few days,” Thomas said. Jeni asked Tom if he would do the honors in a letter. “I was just so thankful that my dad could be here with us today in spirit and a piece of his physical being as well. That was really special for us,” she said. Jeni’s groom was also moved by the gesture. “I was just overtaken with emotions when I finally saw her walking down. 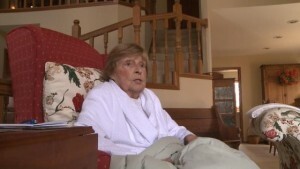 The most beautiful woman in the world that I’ve ever seen before,” Paul Maenner said. “What a greater honor could a person have than walking the daughter of the man who’s given his heart to him. I can’t imagine a greater honor,” Thomas said. https://www.towkars.org/wp-content/uploads/2018/02/towkars-car-donation-logo-300x165-300x165.png 0 0 kidneyadmin https://www.towkars.org/wp-content/uploads/2018/02/towkars-car-donation-logo-300x165-300x165.png kidneyadmin2016-08-12 15:15:202016-08-12 15:15:20Pennsylvania bride given away by man who received her dad's heart. During the last ten years Velour Live Music Gallery has been an integral part of our lives. It’s been a space for us to get to know and watch our favorite bands, where we developed our music and our art, how we cultivated relationships with our fans, where we first met/went on a date, where we got engaged, where we got married, and where we were introduced to our bandmates and often our best friends. We’ve been encouraged to pursue new paths, found meaningful careers and inspiration, and Velour has essentially put our little town of Provo, Utah on the map. For all these reasons (and likely many more) we are getting together to help our friend Corey Fox, owner of Velour, during what is likely the heaviest time of his life. He’s been there for us through things we couldn’t begin to list and contributed to our lives in countless ways, so we want to help him with everything he needs at this time and to ensure Velour’s continued existence. 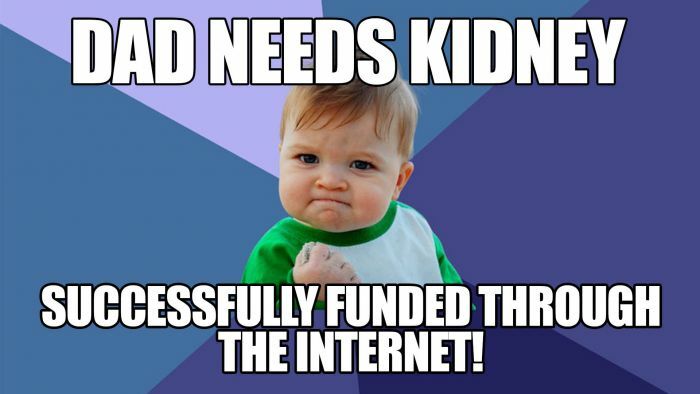 1) He needs a kidney. Corey is currently on the transplant list, but that is a long and uncertain process. It has been highly recommended he find a living donor. For those interested in being tested as a potential living donor, see the instructions below. 2) Because of infection risks, Corey will be unable to be around groups of people during the months of his recovery. For this period, as needed, Velour will need to close — the venue will only be hosting private events, parties and weddings (events the current staff is equipped to manage). Of course the surgery, medicine, recovery time and the desire to keep Velour financially stable during this period has an immense cost attached. As Corey’s friends, we not only want to make sure he has what he needs to comfortably get through this, but that his life’s work will continue to be a valued space where music, art and the community can thrive in years to come. Truthfully, without your help, the impact of a medical need like this one would likely bankrupt a small, single-person owned and operated business like Velour. We’ve been in awe of the outpouring of support we have seen from the few people we have mentioned this to already — Velour and Corey mean so much to us, and we hope you will join us as we help #FixTheFox. any branch to our “Corey J Fox Donation” account. * * * 4/6 Update: The Transplant Clinic has reported they have had an outpouring of support to find Corey a living donor! Thank you to all who have inquired. Currently they need to focus on screening the current batch of applicants, and the size of that group is so overwhelming they have requested we ask Corey’s friends to refrain from applying until we see a need again. Testing will take a few months, so please stay close for news! Hopefully we can come back and let you know we have found a match, but if not we will let you know when we need more applicants. Thank you! The more traffic we get to this page, the higher the likelihood we can help Corey find a kidney and support for his financial needs! We would love to see you using the hashtag #FIXTHEFOX on Twitter, Instagram and Facebook to show your support. 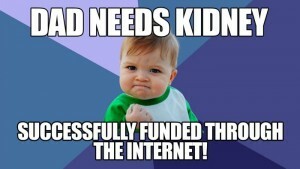 (WAFF) –“Success Kid” got more success than just internet fame. The “Success Kid” meme all started after Sammy’s mom, Laney Griner, took a picture of him, then 11 months old, making a smug face after eating sand. The picture went viral and thousands upon thousands of people made memes out of it with different captions for different life scenarios. CNN reported that Sammy’s mom, Laney, created a GoFundMe campaign with a goal of $75,000 to help cover the medical expenses that go along with a kidney transplant for her husband, Justin Griner. 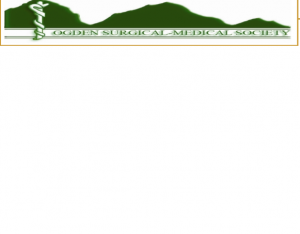 For more information on the Alabama Organ Center, click here. If you’re a match, you can clickhere. Make your car a Kidney Kar! Happy Earth Day! 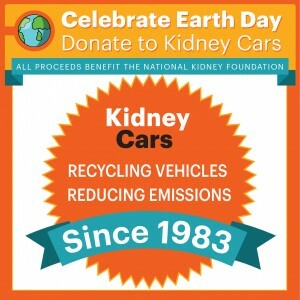 https://www.towkars.org/wp-content/uploads/2018/02/towkars-car-donation-logo-300x165-300x165.png 0 0 kidneyadmin https://www.towkars.org/wp-content/uploads/2018/02/towkars-car-donation-logo-300x165-300x165.png kidneyadmin2015-04-21 13:22:512015-04-21 13:22:51Make your car a Kidney Kar! Happy Earth Day!